1. 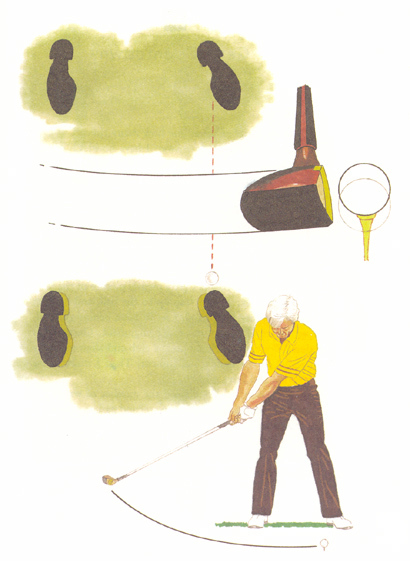 Tee the ball an inch higher than normal, about 4 inches ahead of your left heel. This will enable you to catch the ball just as your club begins the upswing, which means you'll stay behind the ball longer, allowing an extra split-second to build up power. It also encourages a higher-than-normal shot with plenty of hang time, making this a good ploy when you're hitting with a tail wind. 2. Widen your stance a few inches. This will improve your ability to make a long, low takeaway that will increase the length of your swing arc, enabling you to create more club head speed on the downswing. The wider stance also lowers your centre of gravity and creates a lower, more boring trajectory, so this adjustment is particularly useful when you're playing into a headwind.